Nelly Furtado opens up about how she’s spent her five years out of the spotlight, including working at a friend’s record store, and why she needed the break. Larry King: Where have you been? Larry King: You haven’t had an album in five years. Nelly Furtado: No I haven’t. Larry King: What have you been doing? Nelly Furtado: All kinds of fun things that I needed to do. Playwriting classes at university, sewing and ceramics, and I had my own label for a while so I was developing other artists, doing A & R, working at my friend’s record store. 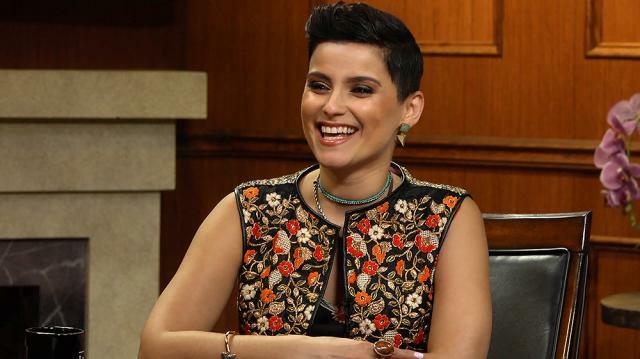 Nelly Furtado: Well, I’m a sensitive girl, and I write all my songs. And I write, and it’s part of my way to stay healthy. I have latent emotionality, so if I’m angry at you, you won’t know till tomorrow, but when I write a song I know I’m angry at Larry, so I need time, I need to make things, I need time to feel things. Larry King: So had you run dry? Nelly Furtado: No, the opposite—well, that’s not true. Yeah, I actually found—I’ve been doing this 17 years, and as a female in the music business out there, you travel the world, and it’s great, it’s a lot of fun, but it’s also a lot of pressure. You have a lot of people around you. I found myself feeling at the end of it all more like a figurehead than an artist, and I asked myself, “Where’s that hippie girl from Victoria, BC? Where’s that girl that used to just put on a flowery dress and sit at the piano and write a song, or the guitar?” And I missed her. Larry King: So she came back. Nelly Furtado: She did, thankfully. Thank god.